Most of us know that Duck® Tape projects are all the rage, but have you seen the Duck Brand® Holiday Tape designs? They are so much fun for young and old crafters and the project options are almost limitless. 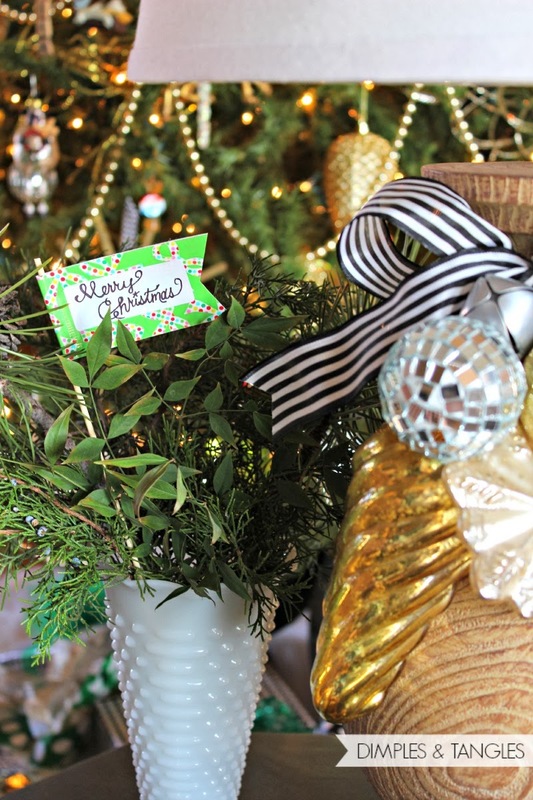 Over the weekend I played around with 4 holiday designs, and came up with some super easy projects to share to help you Duck the Halls! 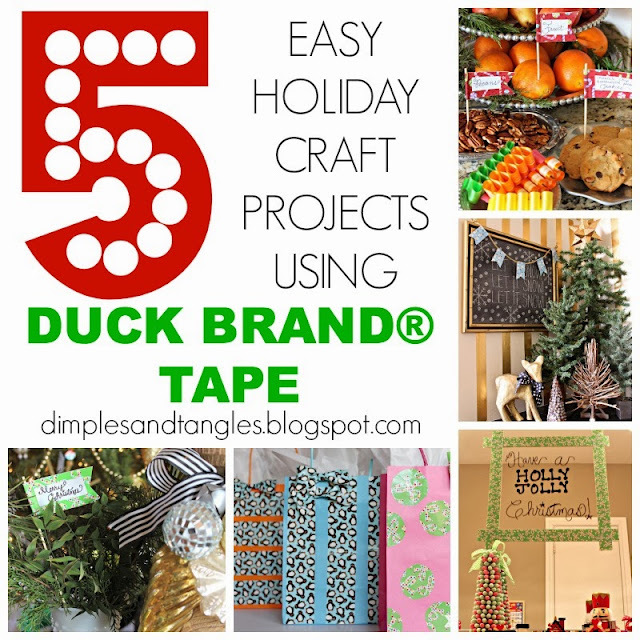 Holiday Duck® Brand Tape, simple cording, ribbon, or jute, wooden skewers, and assorted gift bags. 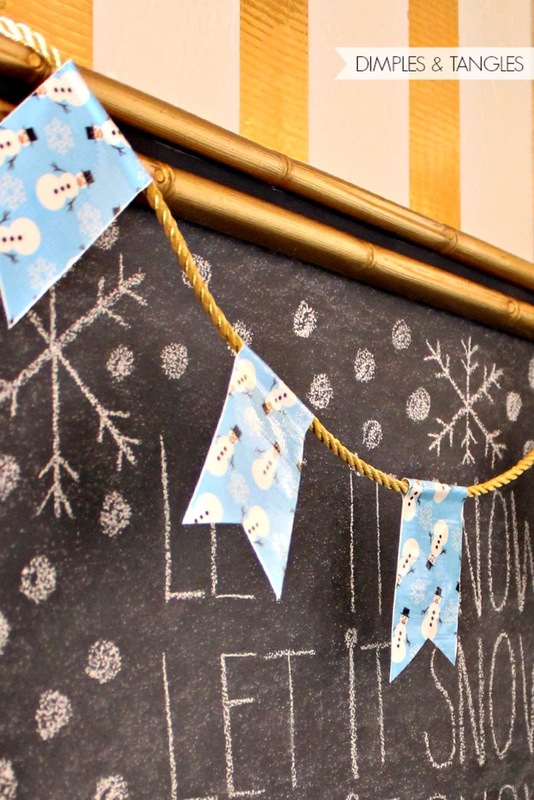 1) Duck® Tape Pennant Bunting: Cut your cord, ribbon, or jute to the desired length. Then, simply cut a length of tape about 10" long. Center your cord in the middle of the adhesive side and fold sides to stick together over the rope. Cut the swallow-tail ends, and that's it! 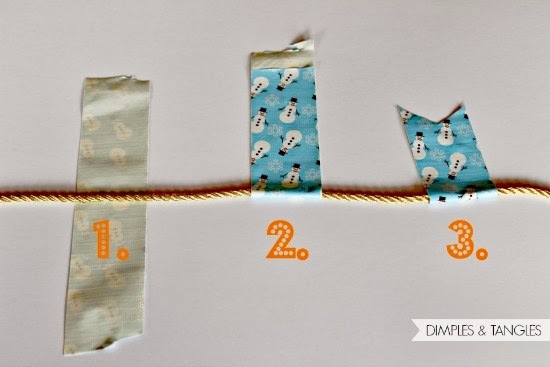 If you want your pieces longer or shorter, just adjust the length of tape that you use. Pssst...the gold stripes and dots are Duck® Tape too! I made over this little niche in my hallway several months ago. Aren't those little snowmen cute? 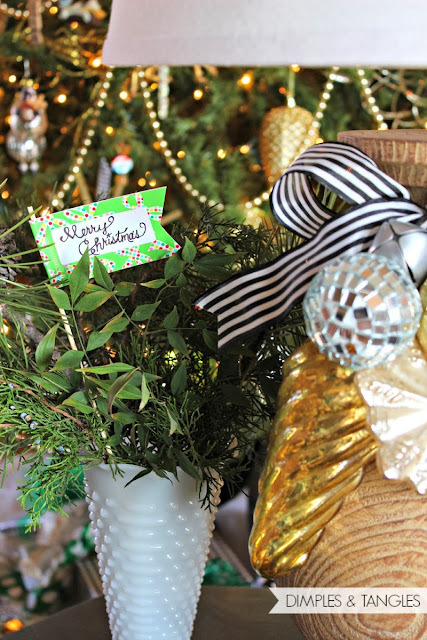 2) Decorative Pennant: Add holiday messages to flower arrangements, potted plants, or greenery containers around your house by wrapping a strip of tape around a wooden skewer and trimming the ends in a flag shape. A white address label affixed to the center helps your message be seen clearly. We had some fun in the kids' bathroom and framed out some messages on the mirror. 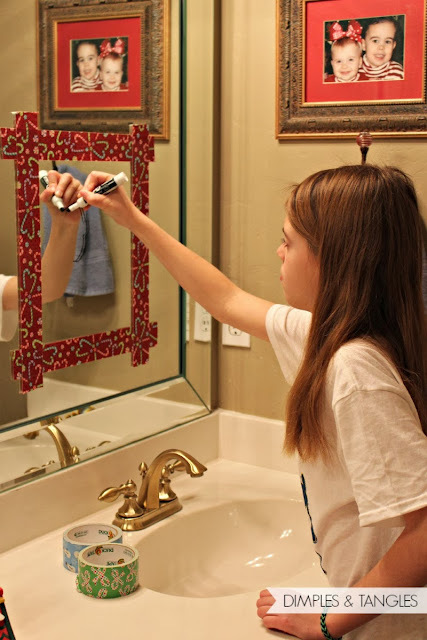 Did you know dry erase markers wipe right off of mirrors, too? And if you're curious, I checked after the tape had been up for about a week, and it peeled off very easily leaving no residue on the mirror. 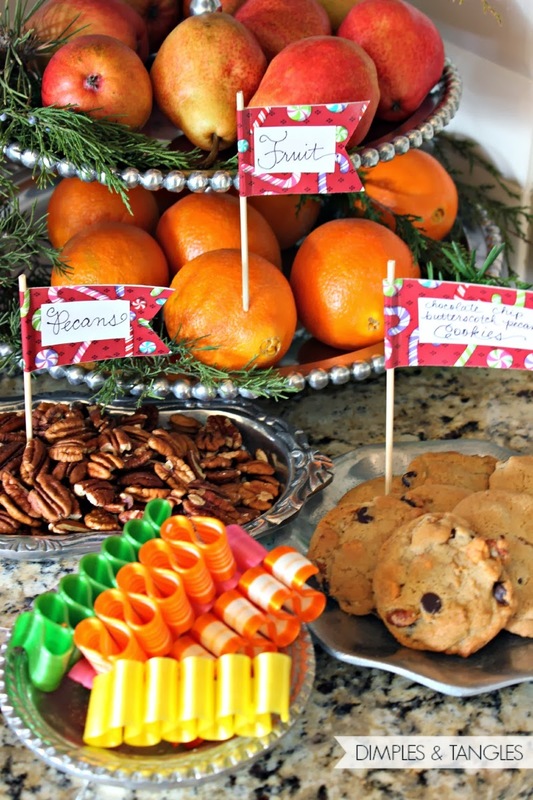 4) Buffet labels: Have plans to entertain this holiday season? Need some easy labels? Use the same procedure as with the decorative pennant, but I cut the skewers in half for this one so they weren't as long. 5) Personalized Gift Bags: As much as I enjoy a beautifully wrapped (boxed) package, sometimes you just need to use a gift bag. However, there's no reason a bag can't be just as creative and personal! 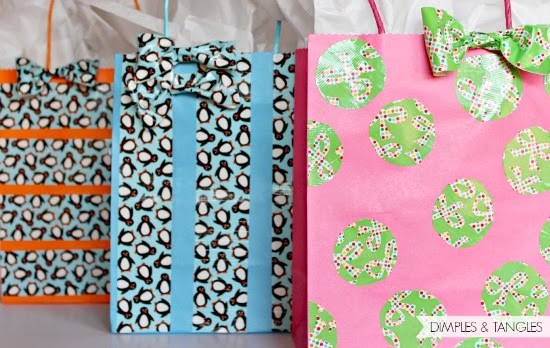 For the young cousins in our family, I made some kid friendly gift bag designs. I simply cut strips and made a variety of designs on the front of the bag. I also cut out some dots for my girly girl niece's gift. To finish the bag off, I added a Duck® Tape bow. It was so easy to make. With a 8-10" strip, I folded both ends toward the middle. I tried not to mash the ends down so the bow would retain a bit of shape on the loops. Then, I pinched in the middle and wrapped a thin strip around the middle. I left the top of the strip free to attach that onto the gift bag. 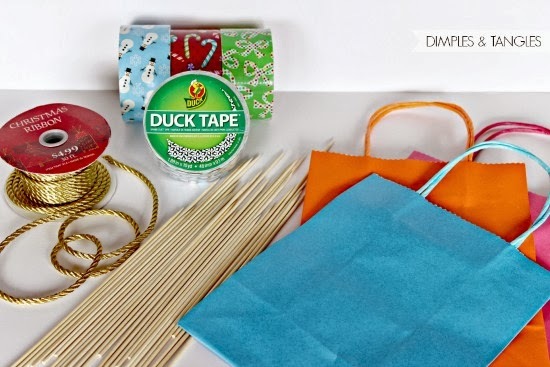 Do you have some great ideas for using Duck® Brand Tape? 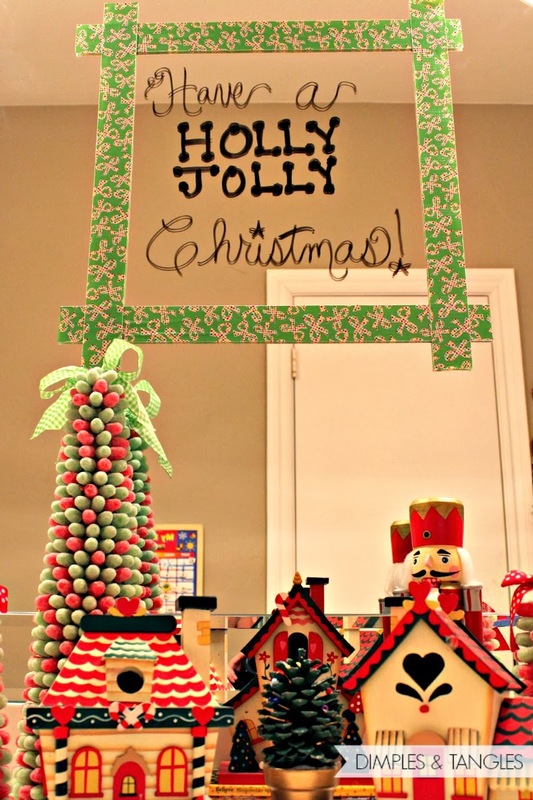 Share them on Pinterest using the #DuckTheHalls hashtag. 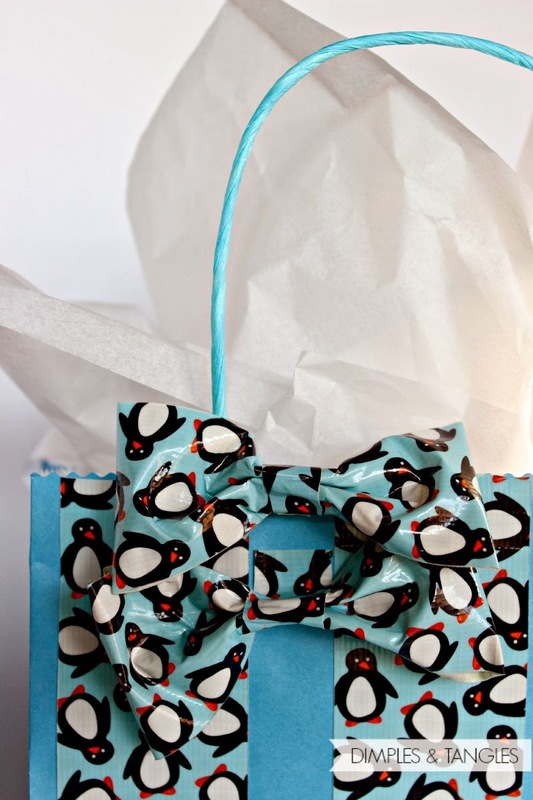 You can also follow The Duck Brand on Twitter or Facebook for lots of other Duck® Tape crafting inspiration! Disclosure: Duck Brand® provided the Holiday Tape for these projects and compensation for this post, but all words and opinions are mine. that is SO fun! and i am with gail- super smart idea! great ideas! fun stuff! My daughter made duck tape hair bows. what can't you do w/duck tape, right?! You never cease to amaze me!! I always love to see what you come up with! Great ideas. Duck Tape is the new super product. 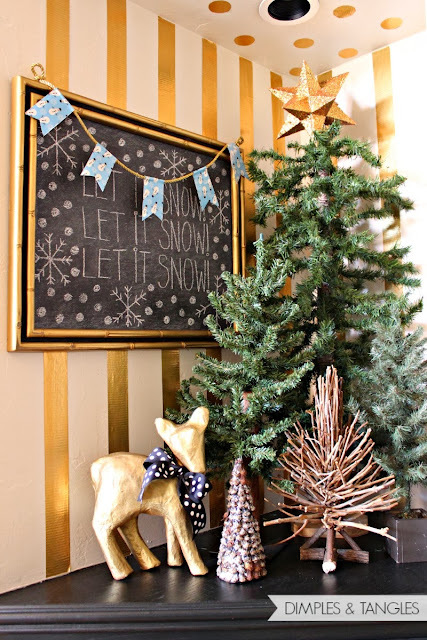 I love your gold stripes wall so much! You know it's right down my alley! Love all the other ideas too. What fun ideas! Duck tape has come a long way! I think my favorite is the bunting! 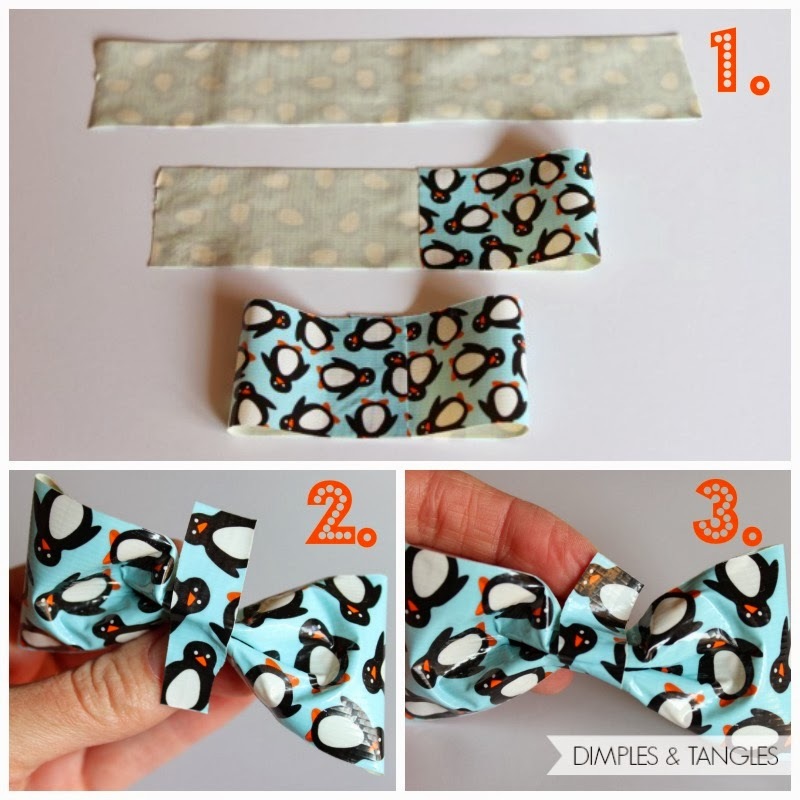 I have a son who would love the penguin tape. Oh, I love the mirror frames and have dry erase markers, but am having difficulty locating these cute Duck tape patterns. Oh, I'm sorry to hear that Sandy. Have your checked Hobby Lobby or Michael's?